The Christmas season always seem to spark the debate of finances. Whether it be about how much to spend on gifts, how much one has already spent during the year, what trips they need to save for so they can have another get-a-way, etc. While I would be lying if I said these didn't happen in my home, I can honestly say, I don't care. I don't care if it seems like a lot of money has been spent and I don't care whether or not I am going to spend more. If I want to buy a little, or big, something for my husband, child, friend, or whoever, I am going to. Buying stuff is kinda what I do. (I'm a coupon fanatic and I'm pretty darn good at it...but more on that later.) What I do care about are memories and time. We have a limited amount of time and memory space compared to the actuality of how long we live. 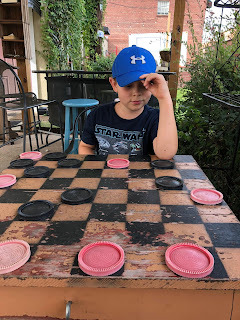 So, I spend the extra time on the phone with my bff when I should be cleaning, drop whatever I am doing if my child wants to go play checkers, say "go for it" to my husband when he wants some time alone. Guess what, none of these things cost a dime and are more valuable than the time spent debating about what we can or cannot afford. I lay on the couch going through photos, read books at 2 am, have insane 10 year old boy slumber parties, let my local friends come and go as they please as if this is their home also. What is more fun than the "guess who is coming through the door" game? All of these things, and so many more, put the things I should be doing behind schedule, but c'est la vie, that's life. It makes me happy and it makes those I love happy. So yeah, I live outside my means and I like it.